● This is only available for iPhone users.It is easy to learn calligraphy.Firstly, you’ll get smart pens and papers. You’ll be able to utilise that lovely pen and different colour effects.Then, a variety of subjects will be available to you like plenty of calligraphic pens, 1 pointed pen, 6 small parallel pens, 12 combined colour effects and 1 eraser etc.After using these, you’ll surely get a good piece of calligraphic writing. ● There is even an inbuilt gallery to autosave your tasks. It can be shared in PNG and PDF formats.It functions so well that people like to use it in their free time and have fun also by competing with their close once to write in different calligraphic methods. Calligraphy is a talent of writing beautifully. The calligraphy is very catchy. The lines have flexibility like the body of a dancer. It can be tilted in whichever way you want it to be. This application offers a lot of options for font styles to write. It also comprises things that can beautify the writing. ● Has a lot of font styles. ● Can select among variety of the colours. 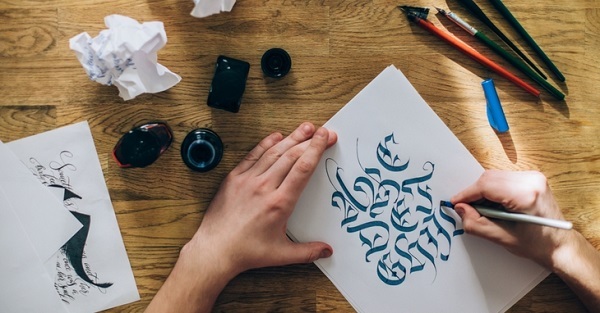 ● Not just save but also can send your piece of calligraphy. ● Calligrapher application is entirely free of cost for Android users.So those who feel that their writing skill is not perfect can immediately access to Calligrapher application. It is easy to use and can be used in many different ways because it has a lot of functions. For instance, one can modify the thickness of a line or put the right colour on it. Your created sheet can also be saved so that you can easily access it and do improvisation on it in future.